Augmented reality is one of the important technological evolutions which have transformed our lives, of course for a better reason. It has changed the way we are interacting with the world. And when we talk about the e-commerce sector, augmented reality has really brought a rapid revolution. The business owners are completely focused on delivering the best shopping experience to their customers, and in this journey, augmented reality plays a significant role while lending a helping hand to the e-commerce sector. This will totally uplift the transform the way people shop over online platforms. How AR can help e-commerce sector? By now, you would be wondering that how will augmented reality seem in real life. Right? So, let's take an example. Suppose you are online buying a sofa for your guest room, you will imagine how will it look with the curtains, will the color go with the walls, and so on. There are a lot of questions which hit your mind. But augmented reality will allow the customers to try the sofa in their guest room and decide if the product is suitable for you or not. 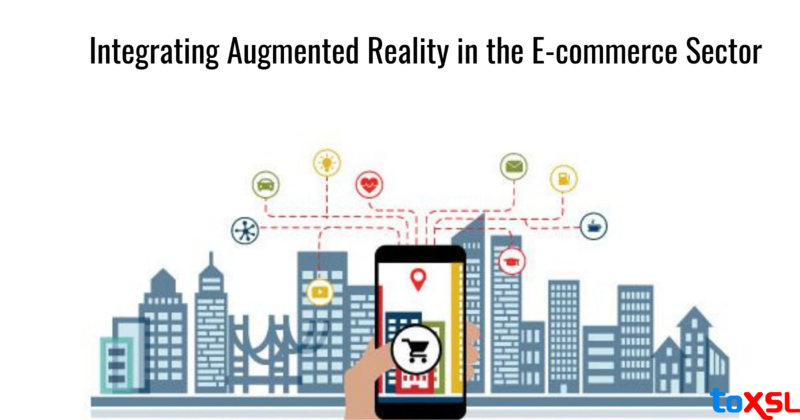 Want to know the other major benefits which augmented reality can bring to the e-commerce sector? Keep reading and know the top benefits offered. Visualize the product experience before purchasing: Introducing augmented reality simply eliminates the ambiguity from the e-commerce purchases by assisting the customers to visualize the product in a context of the physical place they occupy. Augmented reality lets the customers visualize products about how they'll fit in their house. Try out more options without investing time or effort: Trying out different outfits can be quite a time consuming when done manually. Augmented reality reduces this hassle and makes the process smarter. For eg, women can get an idea if the makeup suits their face or not without even applying on their faces. Simplifying choices without risks of post-purchase hassles: Users can simply choose the wall paints beforehand and get an idea about how the walls will look after getting painted. This keeps the customers on the safer side by not regretting in the future about the bad choices. Virtual product aisles: Implementing augmented reality creates a virtual shelf with a variety of products while projecting it on the walls of the guest room. Thereby, the users can get a better idea about the product, make a few clicks, and then make a purchase. AR-powered digital marketing: Augmented reality technique can empower better sales by indulging with social media platforms like Snapchat. This will further build user-generated content and thereby make promotions for more customer engagement. Implementing augmented reality have simply changed the ways people interact and have totally transformed their lifestyles. So, if you are a business owner and wish to develop an augmented reality-equipped e-commerce website, it's time to look up for a reliable web development company. In case you have any queries or want to know more about augmented reality, feel free to get in touch with our team. We would be happy to hear from you.